Private parking available via Schneidergasse. Coming from Waldmohr, drive through Schönenberg-Kübelberg up to the bend in the main road in the lower part of the town, Schönenberg. 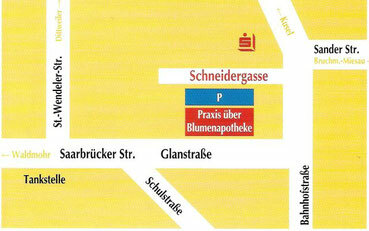 Directly behind that, opposite the bakery and before you come to the Nail Care Studio, Schneidergasse opens up to the left. Follow it for approx. 50 m, until you reach our large private parking on your left. Coming from Sand / Brücken, drive through Schöneberg-Kübelberg in the direction of Waldmohr. After passing the Sparkasse, opposite the bakery and directly after the Nail Care Studio Schneidergasse opens up to your right. Follow it for approx. 50 m, until you reach our large private parking on your left.